The President of the European Council has warned that on the day the 20th anniversary of the Good Friday Agreement is being celebrated "thousands of people are looking with concern and anxiety to the future of the peace process after Brexit". Donald Tusk was speaking in UCD this evening as he was presented with Honorary Life Membership of the UCD Law Society. The former Polish Prime Minister warned: "I don't like Brexit. Actually, that's an understatement: I believe Brexit is one of the saddest moments in 21st century European history. In fact, sometimes I am even furious about it." He added that "now, in the times of Brexit, when European entropy is again starting to compete with European gravity. We have many reasons to be satisfied, as a generation which has united Europe. "But we have as many reasons for concern, as a generation that could still, unfortunately, make it to the gloomy and for sure spectacular show of another European disunion. "You may think I am oversensitive to this threat. But our two countries don't need reminding about how much effort, suffering and time is needed to build peace and unity without coercion, in the conditions of freedom. And how little time and effort is needed to undermine and demolish this structure." "The unity of Europe is not a bureaucratic model. 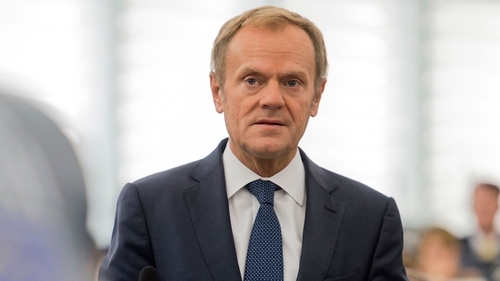 It is a set of common values and democratic standards," said Mr Tusk. In his introductory remarks he said, "I am a Catholic, like the overwhelming majority of my compatriots. I love football as well as rugby: my beloved sports club from my hometown has won 13 rugby union titles. "I am a fan of W. B. Yates, Samuel Beckett, U2 and Sinéad O'Connor - even if she did go a bit too far with John Paul II - Colin Farrell and Neil Jordan. I am even a fan of Conor McGregor, though I must say I have mixed feelings about his latest fight with a bus in New York," he joked.